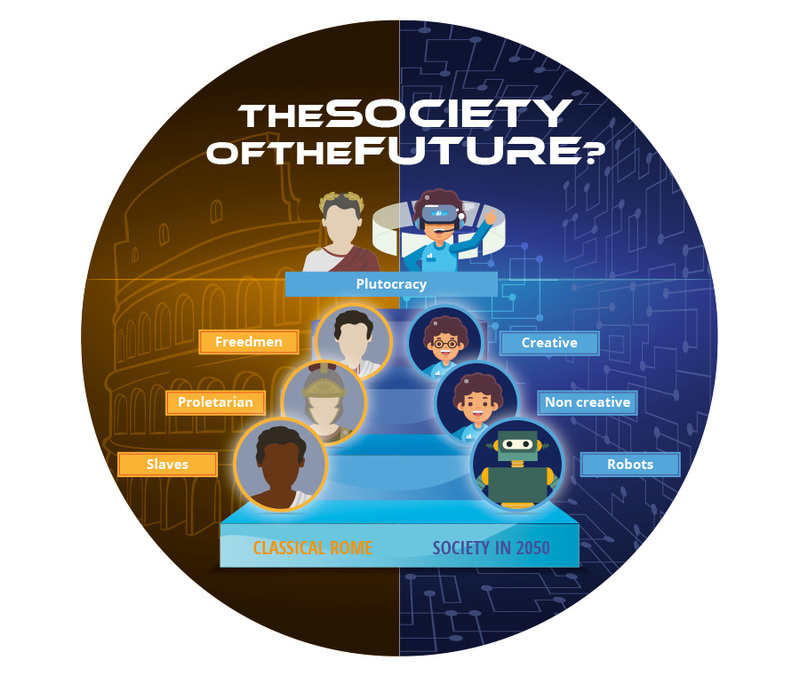 In order to summarize the content of the previously sent posts, I allow myself the “divertimento” of imagining that the society of the future will be in many ways similar to that existing in classical Rome. Please deem this post as a closing for the holidays. During this summer time I will think about how to give continuity to this blog which, in any case, it will be in a different format to the one used up to now. The plutocracy (form of government in which power is held by the riches or very influenced by them), will probably go on. In Rome, the senators represented such group: to become a senator, a high income level had to be credited and they were banned from having a job or a business.In the future a similar social class may exist although with the incorporation, as new conspicuous and eminent members, of the owners of big data, of the great Internet platforms and of the owners of the patents on the modifications of the human genome.What at this very moment, it cannot be said is whether this plutocracy will be made up solely by humans or also by super-humans (humans technologically “improved”), or even by a non-human super-intelligence. The equites (or gentlemen, rich enough to afford a horse to go to war) and the freedmen (illustrated ex-slaves who were in charge of those more specialized tasks) were the ones who took care of the business, education and running the day-to-day government affairs, as civil servants, of the Roman bureaucracy. In the future there will be a similar class made up by those that in previous posts, have been so-called as the creative, amongst which, probably, certain improved super-humans will be included. The robots will replace the slaves in the hardest jobs, servile or routine. In Rome, citizens who had less than two slaves were deemed as extremely poor. Maybe something similar will happen in the future with those owning less than two robots. In 2050, it may be possible the existence of a similar class made up of those workers that have been so-called as non-creative (unskilled) and who, like the “proletarii” of classical Rome, will no longer have economic and military utility. In short if we do not want this last social group to start a revolution and we want that they continue belonging to the category of consumers, I cannot see any other solution but to grant them some kind of income that allows them to live decently in a “low cost” world, product of “Postcapitalism” (that is to say, based in the collaborative economy and in the zero marginal cost). The next question is, where will the financial resources for the subsistence of these passive classes come from? The answers are diverse although they focus mainly on taxes and social insurance that the machines will pay on the added value they generate and on a better redistribution of taxes paid by the economically more fortunate classes.